It turns out that raspberries and orange juice are a fun and entirely compatible flavour combination. When I needed a taste of sunshine last month, these muffins were a perfect pick-me-up. They are also a lovely addition to a weekend brunch, and are well-suited for Easter and other springtime celebrations. I wasn’t sure what to call this recipe. Cupcakes or muffins? 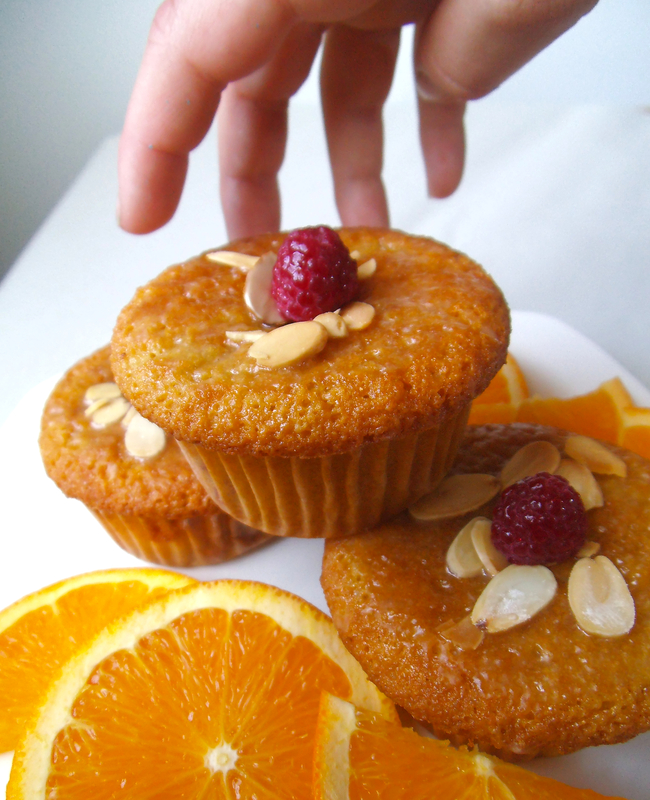 Lightly glazed, these are raspberry almond orange muffins. If you place a thick dollop of whipped coconut cream accented with pink raspberry frosting on top, they turn into cupcakes! So gather your ingredients and then prepare yourself for a fête of flavours, starring a raspberry-citrus blend. To make muffin batter, combine flours, baking powder and salt in a medium mixing bowl. In a separate bowl, beat together honey, oil, brown sugar and eggs until thoroughly combined. Combine wet and dry mixtures and stir until ingredients are incorporated. Do not overmix. Stir in orange juice. Gently fold in raspberries. Pour batter into nine greased or lined muffin cups. Batter should be just slightly below the top of the cups. Bake for about 15 minutes or until muffins test done. To make glaze, whisk icing sugar, orange juice, and almond extract together. Spread glaze over tops of cooled muffins. Sprinkle with sliced almonds. If desired, top each muffin with a raspberry. To make cupcakes, you may keep or omit the glaze and then add coconut whipped cream and raspberry frosting. They look so good! I love the raspberry-orange combination – I make a similar large cake but it also has the addition of some passion fruits – delish! Thanks! Your cake sounds divine! I wish we could get passion fruit more easily here in Canada. They are my husband’s favourite fruit. These muffins look delicious and so moist! 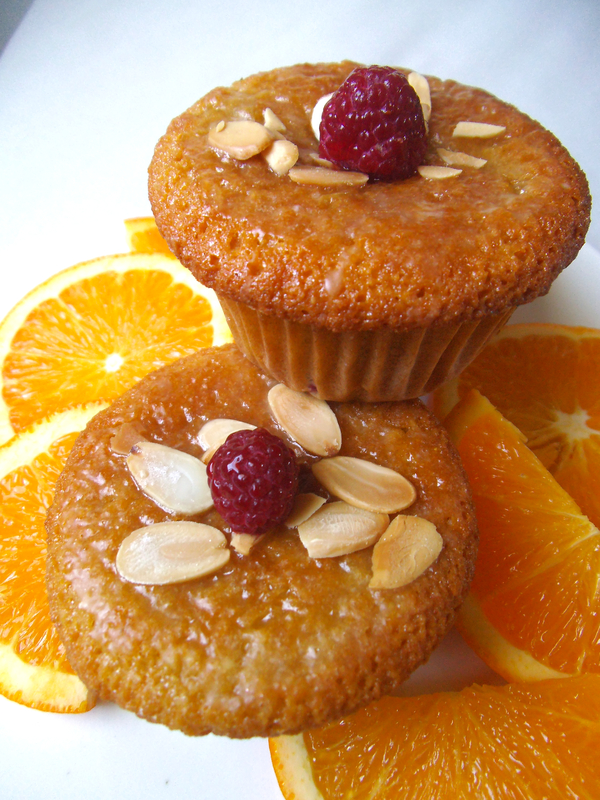 I am a big fan of almonds and love the raspberry and orange combo. The orange glaze sounds fantastic too! Thanks, Kelly! They are very moist, which means they keep nicely in the fridge. Another great recipe from you. 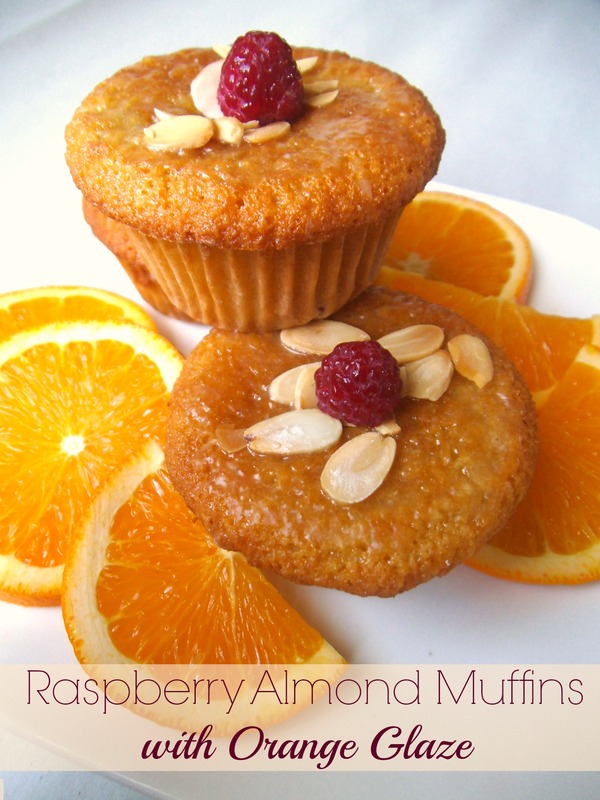 These raspberry almond muffins look and sound great! Thanks for sharing on Saturday Dishes. I pinned them. These look too good! Recipe pinned! These sound and look amazing – my kind of muffin!